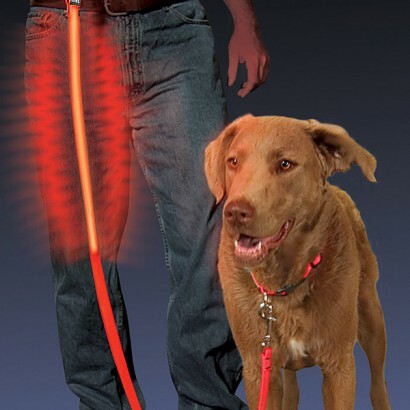 This flashing, glowing illuminated dog lead will help you and your 'best friend' be seen and stay safe at the roadside or in the woods. 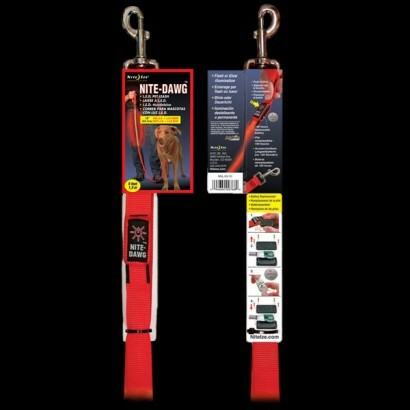 Featuring 18 inches of flashing or glowing illumination from the handle using a clever light-conductive polymer.The Night Dawg illuminated dog lead can stretch a battery out to last 150 hours of constant use and come with a battery supplied and fitted. Made of the same strong material as the Night Dawg Collar, This Illuminated Dog Lead is strong enough to keep fido or rex by your side, and stylish enough that other dog owners may want to take YOU home with them... Well maybe.